Now that you have found your head keywords, it is time to find the keywords that fall into what is often referred to as the “chunky middle” of the search demand curve. What exactly is the chunky middle? I’m glad you asked. The chunky middle are usually more descriptive versions of those head terms. Hint: in the next post, we’ll talk about long tail keywords. For the purpose of this series, we’ll call long term keywords VERY descriptive terms, and loosely related search phrases. I’ll give you a couple of examples now so you’ll have a better idea of what to save for the next post. BUT, we’ll get to that in the next post!! Back to the chunky middle keywords. First, we’ll head back over to Google’s Keyword Planner. Go ahead and type in your main head keyword just like you did last time, looking for new keyword ideas. Notice that there are 800 results here. Sometimes filtering is your best friend. In fact, sometimes you’ll uncover NEW keywords with filtering because it will have to dig deeper. Lets try filtering by search volume. You can also play around with the other settings, I’ll look for keywords with high competition. Next up, I’ll show you a trick for finding keywords based on your competition! First, go to Google and do a search to find a few competitors websites. You can also save national sites, directories, or even Pinterest and Wikipedia results! You’ll get suggestions based on what Google thinks that website is about and the keywords that are related to that website. You might see a lot of the same ideas here, but sometimes you’ll find some great new keywords you haven’t thought of yet. Take some time and try different websites and see what you can find! ALSO, don’t forget you can go back to the ad group ideas and look within the groups for even more specific ideas. Now we’ll go outside of the keyword planner and look for ideas using two of my favorite keyword research tools! Now you’ll get a HUGE list of keywords. This tool looks at the auto-suggested words from Google and compiles every single suggestion into one list. One tip here: The head keyword you start with does make a big difference sometimes. When I tried “wedding photographers” I mostly got suggestions based on local terms (like “wedding photographers in LA”). However, when I changed it to “wedding photography” I got much better suggestions. You’ll have to experiment and see what you get! Another pro tip: If you click on the result (not the little plus, but on the words) you’ll get the suggestions for that word. Lots of hidden gems here! Click the plus to add them to your list, then you can copy and paste your entire list into your spreadsheet where you are saving all these keywords. You can repeat this search for some of the other terms you found in the keyword planner. One more pro tip for ubersuggest: switch the search to “images” and you’ll usually see less of the local modifiers and bring up even more new unique ideas. If you still want MORE keywords, head over to keywordtool.io. I love this tool because it also lets you look at suggestions from YouTube and Bing! The process is essentially the same as ubersuggest, just experiment with some of the keywords already on your list and see what you find! Ok, now that you have this really long list of chunky middle keywords, what should you do with them? First, you should probably organize them by priority. I’d take your really long list of probably hundreds of keywords and run them back through the keyword planner tool to find search volumes. Then I’d take that list and look for the words that are most closely related to your business or that you know you can talk about. I recommend using the chunky middle keywords to create PAGES for your website. Blog posts are great too, and even better for long tail keywords, but these chunky middle keywords with high search volume deserve whole pages on your site. Having a variety of keywords throughout your website will show diversity and search engines love to see that you cover topics related to your main head keyword. Create another column in your spreadsheet to write down every idea that comes into your head for a page about your focus keywords. Want to download the spreadsheet I used while writing this article with all my chunky middle terms and my ideas for page content? Click here and I’ll email it to you! HERE’S THE KEY: If you can create a page that answers every question a searcher has when they use that query, your page will have a great chance at ranking. Your goal should be to create a resource that is 10 times more valuable than the top resources that currently show up for that search query. Sometimes you’ll find that you can dominate the search results for very closely related terms to your head keywords, and these related keywords are still getting very high search traffic! Phew. If you made it this far you are SERIOUS about SEO for your photography business. But did you know that about 70% of searches performed are probably going to be “long tail” keywords? In fact, as many as 20% of searches on a daily basis are totally unique (haven’t even been searched before). So how do you optimize for very specific keyword phrases and how do you even know which ones are worth your time? Tune in for part 3 of this series for more on long tail keyword research for photographers! Want to make sure you don’t miss part 3? 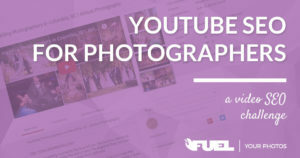 Join the free FYP Facebook group (aka the coolest marketing community for photographers)!!! ^^ Click that picture to join the group!! Or you can click here! Google keyword planner is my SEO best friend, as a blogger it’s something we have to deal with a LOT and sometimes it can be really frustrating working through it. Lots of really great tips here!! Thanks for this information! I’m still working on the Part 1 article, but appreciate someone finally “breaking it down,” because I had no idea!